Sports Awards, Trophies, Promotional Campaigns, Presentations & Gifts | What to do next? Ordering your free colour visual is simple, please follow the instructions below. Upon receipt of good quality artwork our design team will gladly produce a colour visual (free of charge) which will be an exact replica of what you would receive should you decide to proceed with an order. Emailed artwork is preferred and should be sent in jpeg format or similar, however, if this is not possible we can accept artwork by post which can in the form of a cd, or a detailed colour copy or sticker etc. If quality artwork cannot be supplied our design team can produce your artwork for you upon receipt of a letterhead or sketch etc (a small artwork charge may apply). 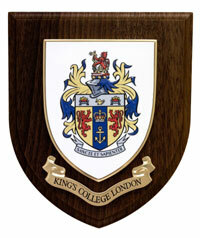 Please tell us what text you would like to be displayed on your shield, for example: - "Thames RFC, Rugby Tour 2007" or "Kings College London" etc. 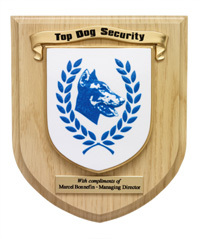 Text can be displayed on the shield using one or two scrolls depending on the amount of text required. Alternatively polished brass plates are available which can be printed or engraved (see pricing). 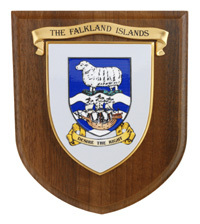 A shield can also be fitted with a scroll and a plate, or if required neither, which sometimes applies to customers that have text incorporated in their design (to view examples please click here). Please tell us your preferred options from above when ordering your colour visual, if you are unsure please feel free to contact us as we are always more than happy to help with your special requirements and offer our expert advice. Wooden bases are available in three different finishes; Light Wood, Medium Wood or Dark Wood. Our design team can recommend the finish which suits your design best, otherwise please state your preferred choice. Heraldic Shields/Wall Plaques are available in two basic shapes, A or B, normally decided by ourselves depending on a customers design. Colour visuals are usually emailed or posted within 7-10 days of order. A design can be produced in a standard format (flat), or it can be embossed which involves raising certain areas of the design creating a 3D surface, for example, on a coat of arms we would raise the mantling and helmet etc, please click here to view both options. 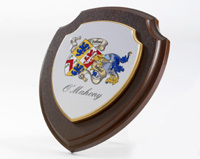 All standard Heraldic Shields/Wall Plaques are supplied individually boxed. A quality presentation box is also available, to view larger image please click here. 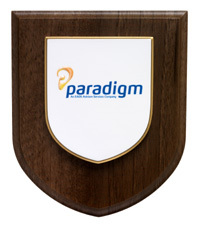 If required a presentation box can be personalised with a metallic gold print displaying a coat of arms or a name etc. 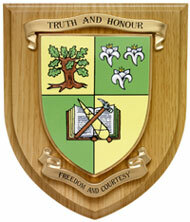 All Heraldic Shields/Wall Plaques are supplied with a fitted hanging devise on the reverse ready for wall hanging. 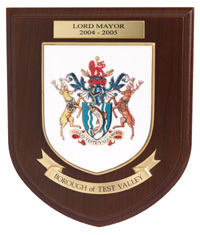 A prop-stand is also available to allow the Heraldic Shield/Wall Plaque to be displayed on a table/desk etc. As all our products are bespoke (made to order) we ask customers to allow four to six weeks for delivery from date of order, however, if delivery is required inside this timescale please contact us as we always endeavour to meet a customers needs and we will do our best to bring your order forward. For quality and service at sensible prices contact Rowan Displays Limited.